Lisa G. Jing, M.A. is an accredited MyBrainSolutions Leadership Assessment Coach and a Certified Corporate Wellness Specialist who draws from her unique background in clinical practice, human resources, coaching, training, and consulting to address current employer challenges related to Employee Engagement, Employee Health and Well-being, and Passion at Work. 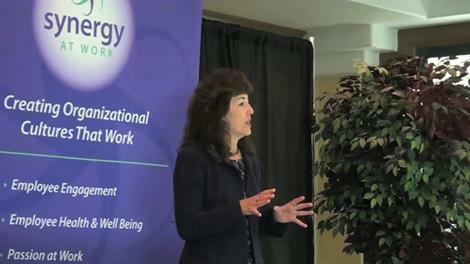 She is a popular speaker at corporate and industry events where she inspires employers to create organizational cultures where healthy habits are the norm; where leaders are effectively utilizing their full cognitive and emotional capacities; where people feel included and respected for who they are; and where employees experience their work as aligned with their deepest values and passions. Lisa is known for thought leadership in the area of mind, body, spirit integration in the workplace and her presentations effectively balance innovative, new ideas with practical know how. Audience members receive many “aha’s” as well as real world strategies and tactics that they can implement right away. The workplace environment plays a huge part in the well-being and performance of individuals and teams, so creating an environment where people are healthy, happy, and productive is critical in today’s competitive landscape. Here at Synergy at Work, we strongly believe that when people are well, they do well and the research supports this. Healthy lifestyle habits form the foundation of a successful work environment and provide the fuel enabling team members to contribute their best energy to innovation, problem solving, and positive customer relationships. When team members are healthy and well, they are focused on delivering value. Organizations that effectively build a healthy, inclusive, organizational culture are most successful in attracting and retaining the best talent. So how do you build an organizational culture that brings out the best in your people? How do you insure that your employees are healthy and resilient? Lisa’s topics are ideal for business owners, executive leaders, and human resources professionals who are committed to optimizing individual and team performance. Lisa can tailor her presentations from 20 minutes to 3 hours or more and deliver them via teleseminar, webinar, or in-person. Her presentation style is engaging, informative, and interactive. For bookings, please contact us.